Michael Brennan has been helping out as a Sacristan since his earliest years in high school. Before each Mass he checks that the correct chalices & purificators are on the credence table. Where else can you involve yourself so easily, but at a Marianist school! The Eucharist is the focal point of each of our schools. Students volunteer their servces to prepare for each of the Student Body Masses. Connor Barrett & Nick Anding assist in setting of the sacred vessels. They also assist at the weekly XLT(EXALT) Worship & Adoration service each week in the school. Dan McQuillan has been a great assistance to the daily Liturgy that takes place at 7:20 a.m. He arrives early to prepare the vessels and to prepare the readings. He has also assisted since May as a Extraordinary Minister of the Eucharist. The month of June is set apart for devotion to the Sacred Heart of Jesus. Margaret Mary Alacoque entered the Visitation Convent in 1671 and six years later Christ appeared to her in a vision in which "I could plainly see His heart, pierced and bleeding, yet there were flames, too, coming from it and a crown of thorns around it. He told me to behold His heart which so loved humanity. Then He seemed to take my very heart from me and place it there in His heart. In return He gave me back part of His flaming heart. "In all, there were four revelations, the last of which is responsible for the nine First Fridays' devotion. Also requested by the Sacred Heart was the establishment of a feast in His honor. We now celebrate this Feast of Sacred Heart on the first Friday after the octave of the Solemnity of the Body and Blood of Christ, in addition to honoring the Sacred Heart every first Friday of the month. The following article appeared in the June, 2009 edition of Via Latina 22, the newsletter from the General Administration of the Society of Mary. In the Congregation for the Causes of Saints they say that the miracle for canonization comes ten years after beatification. 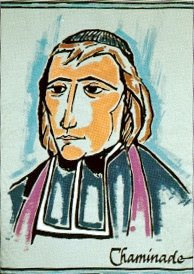 Let’s hope that this is true in the case of Blessed William Joseph Chaminade. 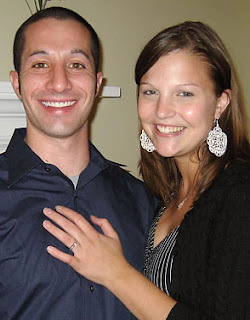 In May 2004, at the age of 24, Rachel Baumgartner was cured of Askin Sarcoma. Rachel was born in St. Louis (USA) in 1983; She is a parishioner of the Marianist parish of Our Lady of the Pillar. At the age of 15 she began to feel the first pains in her shoulder. Since it was a tumor, she received all the medical treatments available. In the year 2000 she made the pilgrimage to Rome with her parish to assist at the beatification of Father Chaminade and to ask his help. But the illness continued to advance. When Rachel was declared incurable by her doctors, in May 2004 she had her last surgery, just to relieve the pain. Her parents, her pastor Father Tobin, and the Marianist community and the parish prayed to Father Chaminade for Rachel’s health. When the doctors examined the extracted tissues, they realized that the cancerous mass was dead. married in July 2008 to Gabe Lozano, son of a Catholic family very involved with the Cathedral Parish of St. Louis. Finally, Glamour Magazine chose her as “Woman of the Year” last year, in great part due to her charitable work. Given the extraordinary conditions of the case, Dr. Bergamini suggested it be studied as a possible miraculous cure. The outgoing Superior General, Father Fleming, asked the Postulator, Father Gascón, to study the case. Father Gascón consulted the Congregation for the Causes of Saints about the seriousness and viability of this process. Having received a positive response from the medical consultor, the Postulator has taken the steps necessary to initiate the cause at the diocesan level. Accompanied by Brother Michael McAward, Secretary General, he traveled to St. Louis last January to speak with Rachel Lozano, Dr. Bergamini, Father Tobin and the Provincial Council of the Province of the United States, in order to pursue this step in the cause for the canonization of Father Chaminade. An attorney, Mr. Gerard T. Noce, former student of the Marianists, has worked at collecting the medical records and the list of witnesses. In a meeting held last January, Father Antonio and Brother Michael communicated to the Apostolic Administrator of the Archdiocese, Bishop Robert J. Hermann, the desire of the Marianists to proceed toward opening the cause of Rachel’s cure. Bishop Hermann received the news happily. The local press has become interested and even published a very favorable article about Rachel, the Marianists, and Father Chaminade. This week Kellenberg Memorial celebrated the graduation of over 500 students! The Marianists and the faculty with the assistance of many students set-up the stage for Mass on Saturday. National Honor Society students and members of SALT assisted the Marianists and the faculty in the set-up at the Hofstra Arena. Every detail was given its proper attention. After a long day the stage was finally set. Mass servers and readers practiced their roles carefully on Saturday for the next day's celebration of the Solemnity of The Most Holy Trinity. The Mass was celebrated by Father Philip and our other Marianist priests. Concelebrating was the uncle of a senior and friend of the Marianists, Msgr. Robert Brennan(Vicar General of the Diocese of Rockville Centre). "For the glory of the Most Holy Trinity, the honor of Mary, and to follow Christ more closely in His saving mission, I promise to God and vow to observe chastity, poverty, obedience, conformably to the Rule of Life of the Society of Mary." Before God and in the midst of our Province, the Brothers make explicit public witness to a communal life style of prayer, Community, and common apostolate. The entire Province rejoice when there is a commitment of vows. Fidelity calls us ever more deeply to the reason for our life together: "the most faithful imitation of Jesus, Son of God, become Son of Mary for the salvation of all." As true sons of Mary, we cooperate and participate in her apostolic mission to bring the grace of redemption to each person. Blessed Chaminade was fond of Mary's message to the servants at the marriage feast of Cana, "Do whatever he tells you" (Jn 2:5), because he firmly believed that we are all missionaries of Mary. Congratulations on many years of faithful service to Mary and the Church! Sacred Heart of Jesus Pray for Us! Central to the homily at our school mass today was an instruction on St. Faustina and the Divine Mercy. Saint Faustina wrote in her Diary, "Today I saw the glory of God which flows from the image. Many souls are receiving graces, although they do not speak of it openly. Even though it has met up with all sorts of vicissitudes, God is receiving glory because of it. and the efforts of Satan and of evil men are shattered and come to naught. In spite of Satan's anger, The Divine Mercy will triumph over the whole world, and will be worhsiped by all souls." May many souls respond to the grace of God! Recently, the Holy Father, Pope Benedict XVI declared the Year of the Priest, to begin in June. May you remain close to the Sacred Heart of Jesus through the Immaculate Heart of Mary. Let us continue to pray for vocations. We have begun a new venture! We have started a vocation blog for the Province of Meribah named Into the Deep. Let us pray that this blog might plant some seeds in the hearts of many to follow Mary more closely as Marianists. The Province of Meribah is happy to announce that Bro. Michael Gillen is our new vocation director.